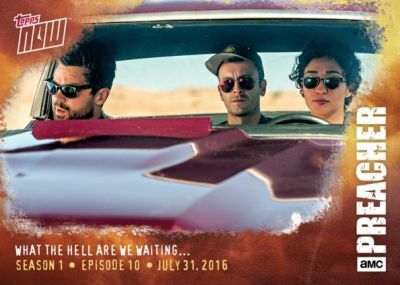 Taking a cue from their inaugural Topps Now Baseball line, the real-time, print-to-order format from Topps has been applied to Preacher, a unique and critically acclaimed series on AMC. 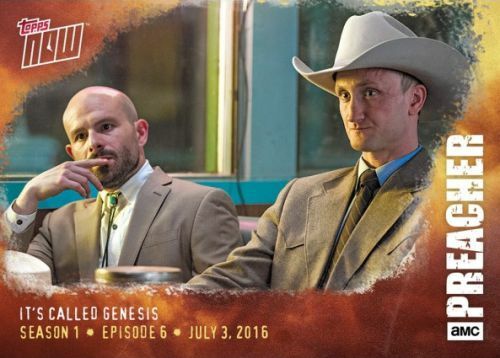 Exclusive to Topps.com, the 2016 Topps Now Preacher cards will be regularly issued with a direct connection to the most recent episode and only sold for 24 hours. 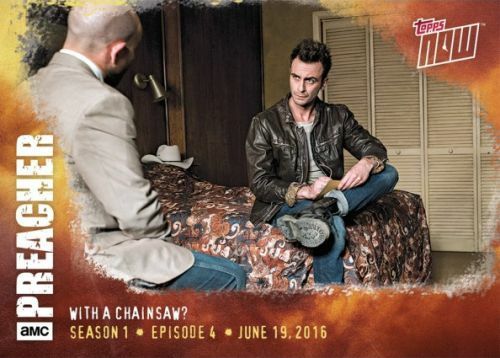 2016 Topps Now Preacher trading cards utilize an on-demand approach that allows collectors to purchase the physical cards online on Monday following the new show that airs on Sunday. The cards will be shipped within 3-5 business days. While the print run is not capped, the finite buying window of 24 hours means collectors won't have long before the card is retired. Once the selling period has passed, the final print runs for each card will be revealed. Unlike Topps Now Baseball, the 2016 Topps Now Preacher cards are sold in episodic sets that include five different cards for $19.99. The price for the 16pt glossy cards includes free Smart Post shipping as long as that option is selected at checkout. Multi-set bundles can be purchased to decrease the price-per-card amount. 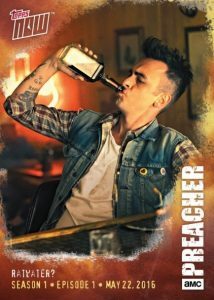 Before entering the world of television, Preacher began on the pages of a comic book with a Vertigo line that totals 75 issues with 66 monthly releases, ending in 2000. 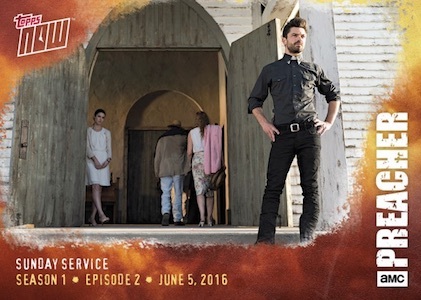 The new series stars Dominic Cooper as Jesse Custer, a small-town preacher who is searching for God. The show was developed by Sam Catlin, Seth Rogen and Evan Goldberg. 2016 Topps NOW! Preacher! Season 1: Episode 3! Only 184 Sets Made! Hot! 2016 Topps NOW! Preacher! Season 1: Episode 4! Only 149 Sets Made! Hot! 2016 Topps NOW! Preacher! Season 1: Episode 5! Only 162 Sets Made! Hot! 2016 Topps NOW! Preacher! Season 1: Episode 6! Only 166 Sets Made! Hot! 2016 Topps NOW! Preacher! Season 1: Episode 9! Only 151 Sets Made! Hot! 2016 Topps NOW! Preacher! 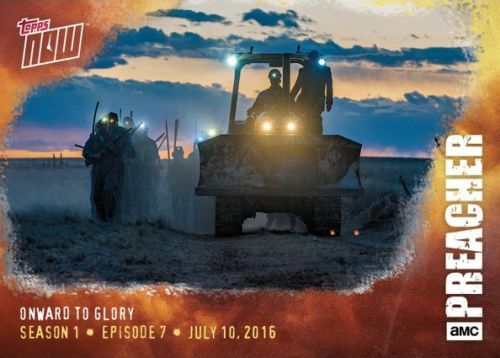 Season 1: Finale! Only 181 Sets Made! Hot! 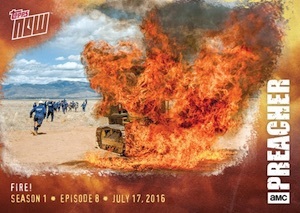 Episodes covered by each card is noted along with the date it aired. 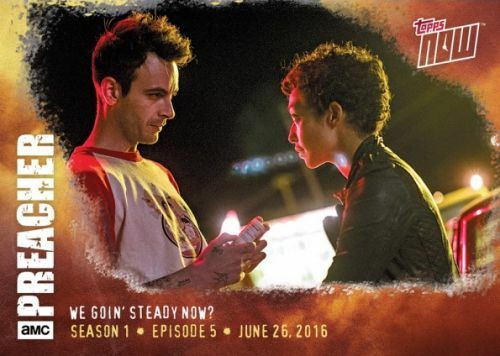 Cards are released the next day for 24 hours and all episodes come as five-card sets. Click on the episode listings below to shop for previous cards on eBay. 6 Have a Drink, Padre? 21 I Need Help, Preassher, What Elsh Ish New? 22 We Goin’ Steady Now? 24 Why Worry at All? 27 What is That Crazy Woman Doing? 29 Wanna See Something Awesome? 36 What'd You Say, Preacher? 50 Tough Somebitch Ain’t You?